"They didn't have to kill him . . . he never drank from the altar of bones." The cryptic words of a murdered homeless woman in present-day San Francisco unlock a decades-buried secret that changed historyand ignite a lightning-fast game of cat-and-mouse from the winding streets of Paris to the faded palaces of Budapest to the frozen forests of Siberia. "You will be the Keeper of the altar of bones . . . and your sacred duty will be to keep it hidden forever from the world." Zoe Dmitroff is told to trust no one in the deadly game she's inherited, but she has no choice but to partner up with ex Special Ops Ry O'Malley whose father's past is the gateway to understanding this lethal enigma. Pursuing the deadly secret unlocks shocking revelations which make them the target of enemies ranging from the Russian mob to high-ranking officials on Capitol Hill to privately trained assassins. Betrayal awaits them at every turn as they race to solve the riddle behind an ancient religious icon. A priceless artifact worth killing for. The dark and unimaginable promise of a power that could change the world as we know it. 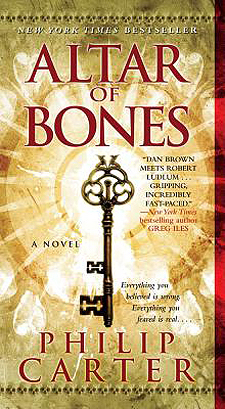 Get ready for the Altar of BonesIt will leave you breathless. Site design © & maintenance by xuni.com. All content © 2011-2019, Philip Carter.